(Oct. 23, 2018) – For the third consecutive year, national dental services provider, Great Expressions Dental Centers, is supporting Breast Cancer Awareness Month by raising funds for the Breast Cancer Research Foundation, an organization working to prevent and cure breast cancer by advancing the world’s most promising research. 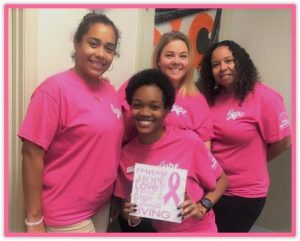 Great Expressions launched a month-long, company-wide fundraising campaign that encouraged employees to purchase a pink shirt in exchange for a $5 donation in support of the organization’s mission. This year’s efforts resulted in the company’s largest campaign to date, as team members raised $9,265 through 1,800 in shirt sales. To join Great Expressions Dental Centers in the fight against breast cancer, visit www.bcrfcure.org.